My experience with Grand Cru Brugundy is somewhat limited up until this point in my wine career. I've probably tasted a couple dozen of them both at trade events and at private parties. I do however, regard them as some of the best wines in the world when they are in prime drinking form. Burgundy as we know, is such a fickle wine region filled with so many great wines but very limited quantities and notoriously spotty vintages. The 1993 Dom. 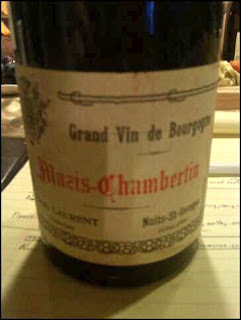 Laurent Mazis-Chambertin is a brilliant wine that is very much still an infant and is drinking amazingly. The first thing to note about this wine is it's amazing color! It shows little to no signs of aging, besides a bit of sediment. The core is extremely dark red, with only the slightest bit of thinning toward the edges of the glass. On the nose I get stunningly bright notes of cherry that combine with chalky-mineral, cola, sarsaparilla, herb, tea berry, sweet tobacco, anise (on the highest registry), and smoked meat. What is so great about this wine is the complexity and ever-changing bouquet. Every ten minutes this wine seems to morph into a completely different animal. On the palate this wine is still very much heavy-laden with lots of tannin and acid, suggesting the youth and exuberance remaining after 17 years. I get flavors of cherry, leather, tobacco, black plum, tea leaf, and slight metallic notes on the finish. What immediately came to mind when tasting this wine is that it's incredibly dry and reminds me of a lot of Nebbiolo wines I've tasted. I immediately suggested that it tasted like Barolo to the tasting group and almost everyone agreed it had striking similarities. Hi Thomas, please take a look at www.thewineshop.com.hk or The Wine Shop facebook page. We carry exclusive distribution of Dominique Laurent and abundant collections of Burgundy wines.